In part 2 of this series, Andy responds to a listener question regarding the topic of clutter in relationships. In part 1 of this series, Andy discusses the topic of clutter in relationship. 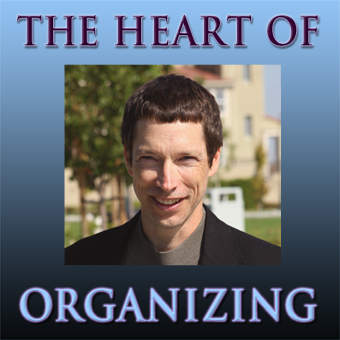 Why it’s hard to organize with a loved one and what to do about it. How you can be more effective when organizing with someone you care about. Paper is the most time-consuming thing to organize. Here is what you want to keep in mind when simplifying and organizing paper. After a brief hiatus, I’m taking the opportunity to honor this time of year by looking at ways we can share our love with each other without cluttering up each other’s lives. In the conclusion of this two-part installment, we continue and complete our sample organizing project. In this post and the next, we go step-by-step through a sample organizing project from start to finish. Our possessions fulfill many important functions in our lives. In this installment, we take a look at what stuff can do for us, and what it can’t. If organizing is arranging your possessions to support what’s important in your life, how can you be really clear about what really is most important in your life? In this post, I describe the best way I have found to keep perspective and not let the busywork of day-to-day life obscure what is truly important. How to give, donate, sell, and recycle your way to a simpler life. These are my favorite resources for getting unneeded stuff to places where it can be put to good use. Simplify your life in a satisfying, environmentally-sustainable way. Three different ways a state of disorganization can cause stress and what to do about them. Bringing awareness to how you make decisions while organizing, including choices, habits, change, and risk. Myths related to organizing: OHIO (“Only Handle It Once”), Gadgets and Products are the answer, Organizing Equals Decluttering, and others. If you’re afraid that if you put something away you’ll forget about it, you may tend to leave things out so you can see them. This post highlights the drawbacks of being dependent on visual reminders. Storing: finding a home for a category so it is well-positioned for future use. Four criteria to use when storing. The importance of labeling and using containers. Sorting: putting similar items together. Sorting recommendations. What to do when an item could belong in more than one category. Three more challenges you may encounter while simplifying. The discussion involves different ways to value possessions, what it means to waste, and how to simplify projects. Have you ever kept an item you don’t like because it was given to you by a friend? How to honor the good intentions of the gift-giver and still make decisions that serve you. “I might use it someday” is a phrase professional organizers hear a lot. When simplifying, how do you respond to possessions you “might” use “someday”? You most likely have emotional relationships with many of your possessions. The emotional responses evoked by so many objects can become overwhelming. This podcast describes how to respond in a way that honors your emotions and still lets you make progress organizing. There’s a cost associated with every object. Andy points out all the costs, both hidden and obvious, of objects.